Here's a pistillate or female flower of a Silver Maple (Acer saccharinum) flower. This is the flower that will develop into a seed if it's pollinated. The seeds are called samaras. You probably know them as helicopter seeds. 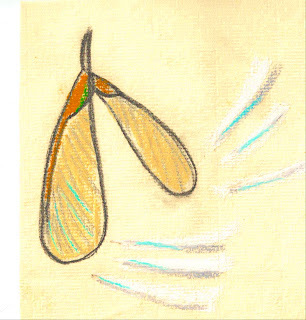 The wings help the seed spin away in the wind from its parent tree. If you look at the light green part of the flower, you can see the shape of future seed. Look in some of my previous posts for other pictures of Silver Maple flowers.